The EUY adopts the basic Yoga tenets as defined in the Yogasutras of Patanjali. The EUY Yoga training follows the framework given by the classical yoga texts. Yoga in the EUY is non-competitive. 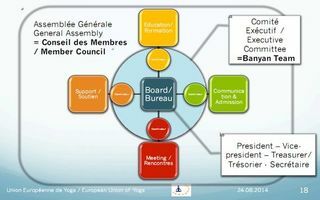 The Statutes are the Governing Rules and Policies that define the structure and principles in running the EUY.